The debate over the future of West Linn's city-owned facilities is, in many ways, defined by the absence of a middle ground. One side — which includes West Linn Parks and Recreation senior staff, two City Council members and a number of other volunteers and residents — favors a more cautious approach to spending on aging buildings like the old Bolton and Robinwood fire stations, but insists that they do not want to abandon the buildings altogether. Others feel that the buildings — and the volunteer groups associated with them — are being presented in an unfair and disparaging light as the City pushes for the construction of a new multi-purpose recreation center that would serve as a central hub for all residents. The back-and-forth has continued for years now, and at times fractured the City Council as it pushed for the renewal of a general obligation (GO) bond that would provide funding for city projects. Just before the successful May 15 vote, resident Peggy Kirkendall publicly accused Parks and Recreation staffers Ken Worcester and Ken Warner of electioneering when providing comment for a Tidings article detailing the department's hopes for a new recreation center — a claim that City Manager Eileen Stein found to be unsubstantiated. Meanwhile, the council continued to discuss the future of city facilities at its most recent special meeting June 5. So why all the rancor? To start, it helps to know some history. And there is some irony to be found in the past, as many of these buildings were — or still are — places that helped build a sense of identity and teamwork in their respective neighborhoods. The fight to preserve that ethos has at times diminished it. While the City also owns buildings like the historic McLean House, Adult Community Center and the old city hall (which was also used as a police station), it's the old fire stations that generate the most discussion. The City originally owned three fire stations — Bolton, Sunset and Willamette — operated by a volunteer department. The Robinwood Station — then known as the Cedaroak Fire Station — was also volunteer-operated and became part of West Linn's volunteer department when Robinwood was annexed into West Linn in the 1960s. According to a report generated by the Parks and Recreation department in 2017, "The three stations within the City limits of the time were all built with briefing/meeting rooms and kitchens to support the functions of the volunteer firemen, but they were also all built with community center components within the building, e.g. large multipurpose rooms with hardwood floors, and additional rooms for meetings." The Cedaroak station was approved by Clackamas County for a similar use as a fire station and community center, but as the report noted, it "ended up with only a small kitchen and briefing/meeting room and the double fire truck bay" — the minimum that was needed to support the firefighters. The City switched to a professional fire department in the early 1980s, and the new fire department was headquartered at the old Bolton station while taking over management of the other stations around the city. The station was also used as the city's library until 1989. Meanwhile, the City added a recreation portion to the parks department in 1994, which at that point took over management and operations of the Sunset and Willamette fire halls. As time moved on, Sunset — which was equipped with a small stage, dance floor and small living area upstairs and a kitchen and dining area downstairs — became a hub for City-sponsored recreation activities. "At that time, we did not have an Adult Community Center, even though we started working with seniors in 1994 to have a senior room at Bolton," Assistant Parks and Recreation Director Ken Warner said. "The only recreation we had was at Sunset." By the 1990s, the Cedaroak station was being phased out as a fire hall and was instead being used as an ambulance station for American Medical Response (AMR). The City began contracting services with Tualatin Valley Fire & Rescue (TVFR) in 1998, and after that the Cedaroak station was used only for parking spare engines, according to the City. The City annexed into the TVFR district in 2003, which prompted further changes in the use of the stations. "A formal agreement regarding the operation of the public facilities within the Sunset Fire Hall was signed by the City and TVF&R in 2004, and remained in effect until construction was completed on the new Bolton and Willamette Stations in 2010," the report read. "At that time, the deeds to the old Bolton and Sunset Fire/Community Halls reverted back to the City." The old Bolton building has been used as a storage facility since then, while the old Willamette station was demolished to make way for the new one. Sunset, meanwhile, continues to be a vital resource for the parks and recreation department, according to Warner. In 2017, the City had 89 rentals of the building while holding 93 recreation programs and a total of 440 classes there. "Sunset serves a vital role for the recreation program," Warner said. "It's programmed very heavily in the summer and Monday through Friday, year-round. ... Even in its current state today, Sunset has been built in a fashion that is more conducive to community use." But while the City has honed in on Sunset, other stations like Cedaroak — now called Robinwood Station — haven't been left to rot. The Friends of Robinwood Station (FORS) group has managed the building since 2010, performing significant renovations at times on its own dime. "All of the work was done by volunteers," said FORS member Kevin Bryck. "Some materials were reimbursed by the City. Volunteers would go out to Home Depot and buy materials, hoping we'd get reimbursed." There have been a number of hiccups over the years regarding both permitting and planning at the station. The station is located in an R-10 single family residential zone, with allowed uses as a fire hall and meeting room, and in 2011 West Linn issued a temporary use permit for FORS to use the building as a community center. At that time, the City believed FORs would apply for a permanent conditional use permit (CUP) within a year. FORS eventually submitted a CUP application in 2013, but it did not progress as the City continued to discuss how to approach the matter. In 2015, City Council approved a $40,000 allocation for a consultant to assist with the CUP application process, but those funds have yet to be spent. 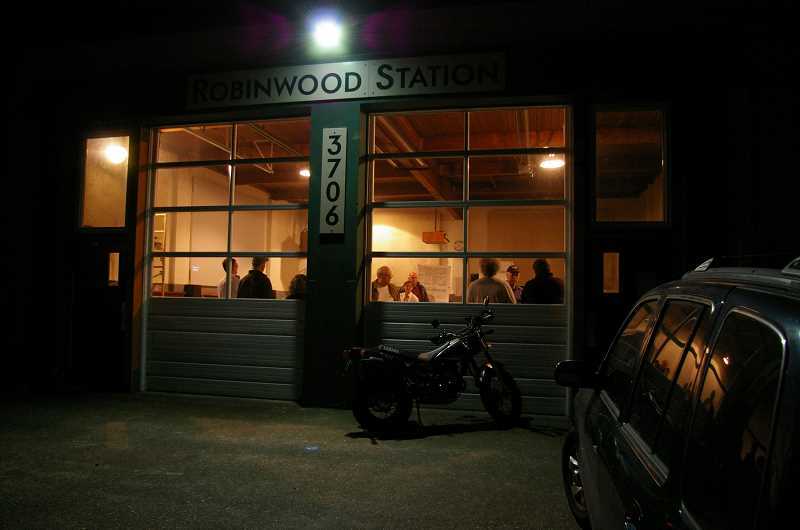 Last year, the council opted to amend its community development code to allow for a community building specifically at the Robinwood Station address. Now, with the hope of securing some of the GO bond funding for renovations at the building, FORS recently submitted a draft master plan to the City outlining its goals and the projected costs associated with them. "Having operated this on a daily basis for eight years now ... we have a good idea of what we need to upgrade from the City, but our needs haven't translated to a master plan that's adopted," Bryck said. The proposed improvements include seismic upgrades, insulation, a second bathroom that is ADA-accessible and new additions to the kitchen. Local contractors told FORS the work would likely cost between $500,000 and $700,000, but Bryck says that number skews high and a good portion of the work could once again be done by volunteers. Currently, the station is home to a number of regular meetings held by groups like the Robinwood Neighborhood Association, the Young Magicians program, Independents for Progressive Action and Tools 4 Troops. "We also have some programs we sponsor," FORS president Randall Fastabend said. "We have a quarterly free concert, a repair fair (and) a plastic and Styrofoam recycling event ... There are lots of private events that happen here as well." Indeed, the space is available to rent for $20 an hour if you're a West Linn resident, $40 an hour for groups outside of the city and $60 an hour for corporations and institutions. Nonprofit and private sales events are negotiated on a case-by-case basis. Warner said that, in general, "Robinwood is not real heavily booked," but Bryck and Fastabend see plenty of potential moving forward. "(Activity) has been pretty steady the last five or seven years," Fastabend said. "There's room in the schedule for things ... holding us back was, for many years, we didn't have a conditional use permit. We didn't get cache from the City as far as, we weren't on the website. "We look forward to having increased usage this next year." According to the calendar used to schedule events on the Robinwood Station website, a total of 351 events were held at the building in 2017 — averaging out to about 29 per month. 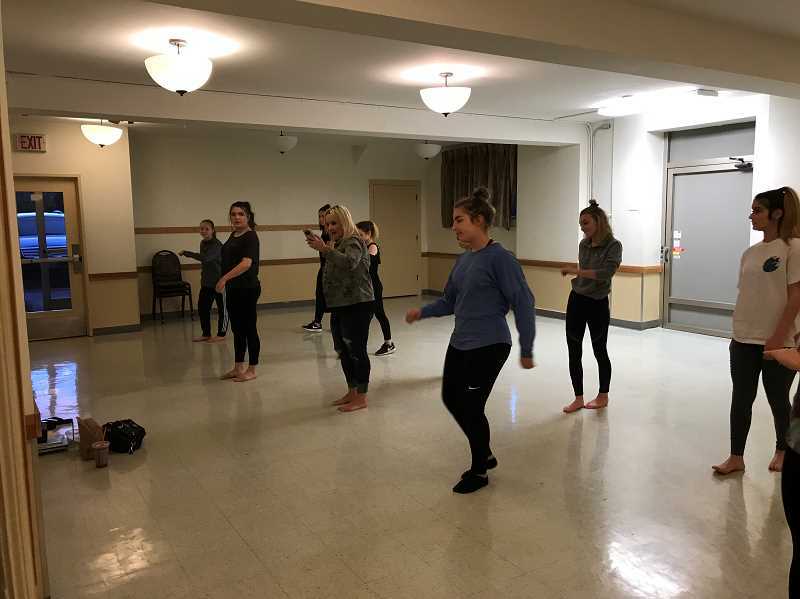 Fastabend said the space can operate as an "incubator" for burgeoning businesses, and noted that a taekwondo class started there before growing to the point where it could find a new space. "This space is really good at starting things," Fastabend said. And Robinwood volunteers say the price tag for the City is minimal. As the owner of the building, West Linn is in charge of paying utilities, which come out to about $1,800 per year. "West Linn gets a community center operated for $1,800 a year," Fastabend said. Fastabend and Bryck hope it stays that way, and don't foresee any significant changes like the City selling the property to FORS. "The property tax alone would put us out of business as a community center," Bryck said. Stay tuned for part two of this story in next week's West Linn Tidings, which will cover the debate over a proposed Bolton community center and the big picture outlook moving forward.